One of the most obvious and essential activities of fungi today is the degradation of plant and animal tissue. Without this activity, life on Earth would cease. As a result of the carbon cycle, atmospheric CO2 is fixed into organic molecules in plants via photosynthesis. Then after the plant dies, it is ultimately degraded by fungi (and bacteria); this process in turn releases the CO2 back into the atmosphere. 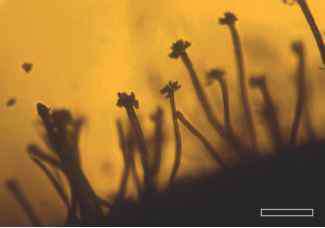 FIGURE 3.76 Callixylon tracheid containing fungal hyphae (Devonian). Bar = 35 pm. Givetian (Middle Devonian). Today, fungi continue to be the primary decomposers of lignin in the ecosystem. The presence of wood-rotting fungi in Callixylon, one of the oldest known trees (Meyer-Berthaud et al., 1999), provides compelling evidence that this important saprophytic association between fungi and vascular plants arose around the same time that wood development began. 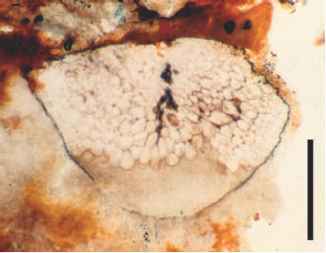 Fossil evidence of this association also provides a proxy record of the type of decay process and the basidiomycetes that were responsible for it. 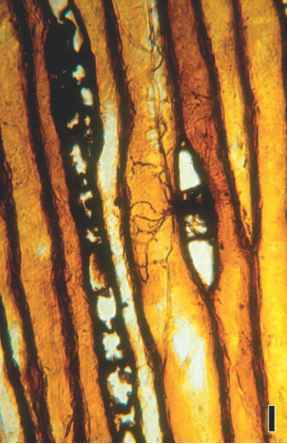 For example, white rot (degradation of both cellulose and lignin) and brown rot (degradation of only the cellulosic part of the wall) can be distinguished by observing tracheid cell walls in fossil wood. FIGURE 3.77 Septate hypha with terminal chlamydospore in Callixylon wood (Devonian). Bar = 12 pm. wood for several hundred million years. Does this mean that the relationships between certain types of fungi and woody plants coevolved as the fungi continued to adapt to new plant hosts? Perhaps the enzymatic system responsible for selective wood degradation evolved several times or in multiple groups of fungi, or perhaps the microenvironment of wood is so similar in all gymnosperms that fungi, once adapted to this habitat, showed little change. It may be possible to answer questions such as these in the near future by using molecular or isotopic techniques applied to modern and fossil wood-rotting fungi. FIGURE 3.80 Section of Araucarioxylon wood showing wall appositions (arrows) (Triassic). Bar = 50 |im. 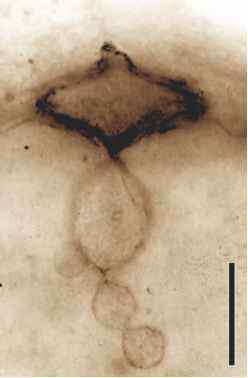 FIGURE 3.81 Cortical cell in rhizoidal ridge of Nothia aphylla containing numerous fungal spores (Devonian). Bar = 30 |im. (Krings et al., 2007a). 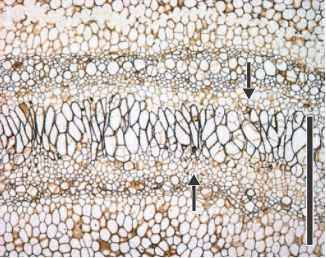 Parts of the rhizome have hypodermal cells with thickened walls (FIG. 3.83) (Krings et al., 2007a). 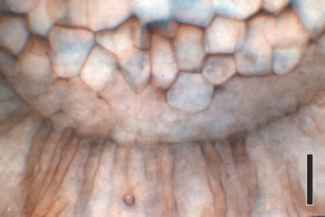 Other parts show areas that are devoid of cells (FIGS. 3.84, 3.85), or include degraded cells, suggesting that the host may have responded to infection through programmed cell death. Both responses are seen in living plants and function to prevent further spreading of the parasite. The production of resinous material (FIG. 3.86) is another response to fungal invasion of living plant tissue. This type of host response has been noted in wood of Callixylon newberryi from the Upper Devonian and may be more widespread in fossil woods, but as yet underreported. 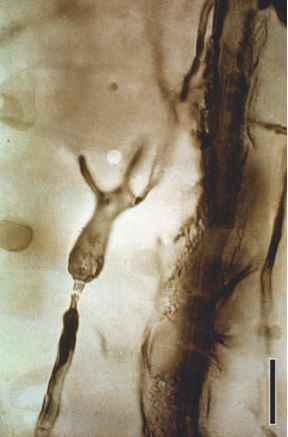 FIGURE 3.82 Nothia aphylla rhizoid with swollen area containing endophytic fungi (Devonian). Bar = 60 |im. 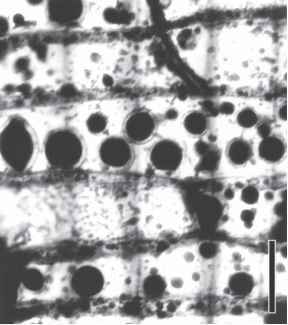 FIGURE 3.83 Partial section of Nothia aphylla rhizoidal ridge and host response to fungal attack in the form of zigzag line (arrows) of secondarily thickened cell walls (Devonian). Bar = 500 ^m. 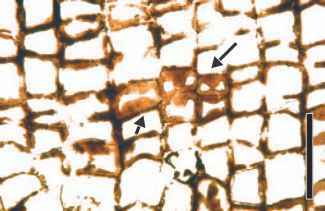 FIGURE 3.84 Nothia aphylla rhizoidal ridge axis showing rhiz-oids and space where tissue is lacking (Devonian). Bar = 60 |im. 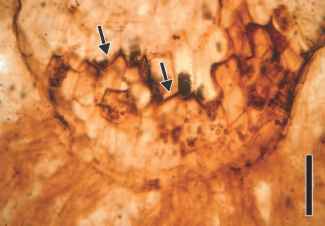 FIGURE 3.85 Section of Nothia aphylla rhizoidal ridge showing void in response to fungal attack (Devonian). Bar =100 pm. areas of disrupted cells. Similar symptoms are known in living trees and are associated with the extant fungi Heterobasidion and Armillaria. The large number of trees with similar symptoms at the same stratigraphic level suggests that perhaps the forest was attacked on a large scale, much like the action of modern Dutch Elm disease (Creber and Ash, 1990). 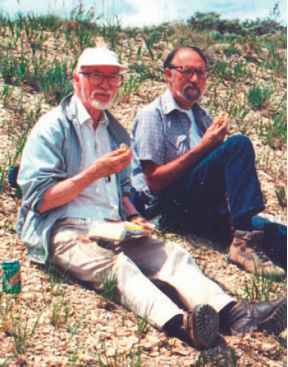 FIGURE 3.87 Geoffrey Creber (left) and Sidney R. Ash. Another interesting host response which has been observed in fossils is hypertrophy, an abnormal increase in cell size. 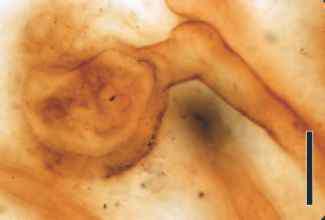 A charophyte alga (Chapter 4) from the Rhynie chert, Palaeonitella cranii, shows greatly enlarged cells in response to infection by the fossil chytrid Krispiromyces discoides (FIGS. 3.88, 3.89) (Taylor et al., 1992). The consistent presence of this chytrid embedded in the walls of the hypertrophied algal cells indicates that the alga was alive when infection took place, and that the abnormal increase in cell size represents a host response (FIG. 3.90 ). Interestingly, identical examples of hypertrophy have been reported in the extant charophyte Chara (Karling, 1928). Other forms of chytrid parasites are reported in and on various other fungi in the Rhynie chert (FIG. 3.91) (Hass et al., 1994). 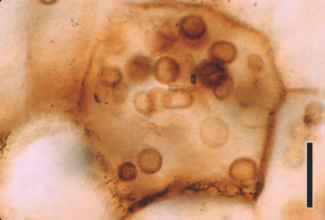 For example, chlamydospores associated with the AM fungus Glomites rhyniensis contain papillae extending from the inner surface of the spore wall (FIG. 3.92) which are identical to those produced in living glomeromycotan (FIG. 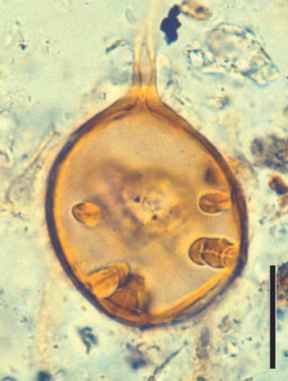 3.93) spores attacked by chytrids (Boyetchko and Tewari, 1991). Other spores have minute holes like those produced by certain actinomycetes (Lee and Koske, 1994). These examples of mycoparasitism (FIG. 3.94) underscore just a few of the microbial dynamics that occurred in and around the freshwater pools of the Rhynie ecosystem in the Early Devonian. 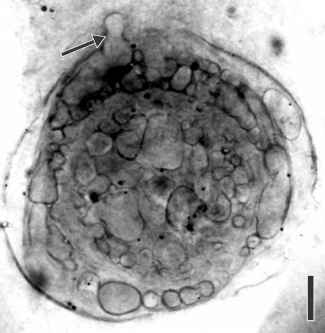 FIGURE 3.88 Section of hypertrophoid cell of Palaeonitella with chytrid (Krispiromyces discoides) (arrow) penetrating cell wall (Devonian). Bar = 80 pm. FIGURE 3.89 Krispiromyces discoides (see FIG. (Devonian). Bar = 25 pm. 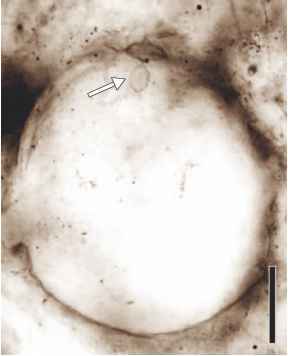 FIGURE 3.90 Two hypertrophoid cells of Palaeonitella cranii. Arrow indicates normal cell size of axis (Devonian). Bar = 275 pm. 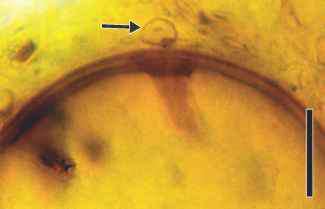 FIGURE 3.92 Chytrid (arrow) on surface of chlamydospore. Note host response in form of papilla inside spore wall (Devonian). Bar = 20 pm. from some other source (e.g., host leaf excretions or exudates from animals), the presence of haustoria like those of modern parasitic fungi, and the reaction of the leaf to this pattern of penetration, suggests that these fungi parasitized the angiosperms on which they grew. FIGURE 3.93 Chlamydospore of extant glomeromycotan fungus showing host response in the form of wall papillae. Bar = 100 pm. 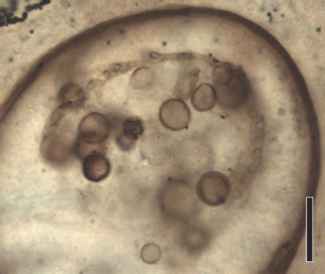 FIGURE 3.94 Parasitic or saprotrophic fungi inside glomeromycotan spore (Devonian). Bar = 80 pm. 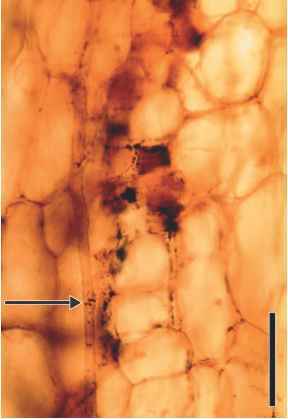 FIGURE 3.95 Hypha (arrow) extending through gametangi-ophore stalk of Lyonophyton rhyniensis (Devonian). Bar = 35 |im. cannot be used to conclusively demonstrate a physiological function in a fossil plant, the direct correspondence between arbuscule formation in extant and fossil plants, including location within the host plant and morphology of the arbus-cules (FIG. 3.96), is striking. Other forms of evidence, such as molecular sequence data calibrated to molecular clock assumptions, also support the existence of endomycorrhizal symbioses by the Early Devonian (Simon et al., 1993). It is hypothesized that one selective advantage of mycorrhizae is the ability to increase the plant's uptake of phosphorus via the extended hyphal network. This certainly may have been an important attribute in what must have been a nutrient-poor substrate during the Early Devonian of the Rhynie site. Unfortunately the earliest land plants ( Cooksonia-type organisms) are preserved as impressions or compressions, and so their mycorrhizal status is unknown. Molecular biology does suggest, however, that the Glomeromycota extend well back into the Paleozoic (Berbee and Taylor, 2001; Taylor and Berbee, 2006), and even into the Precambrian based on some accounts (Heckman et al., 2001). By conservative estimates this would mean that by the time of the Early Devonian Rhynie ecosystem, fungal relationships with plants were well established, and this is borne out by morphological and structural features of both the host and the fungus. 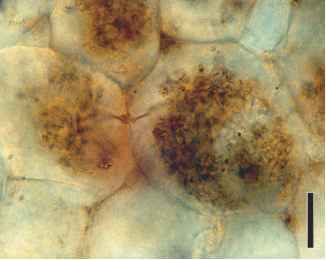 FIGURE 3.96 Detail of arbuscules in Aglaophyton major cortical cells (Devonian). Bar = 30 |im. could be successfully undertaken. Although it is estimated that >90% of all living plants enter into some type of myc-orrhizal symbiosis, there remains little information about the spatial and temporal distribution of mycorrhizae in geologic time. For example, we know a great deal about Carboniferous coal swamp plants. Were they all mycorrhizal, and if not, why not? What is the distribution of mycorrhizae in major groups of plants which are anatomically preserved, that is either as petrifactions or as permineralizations? These and many other questions can have important implications in deciphering the evolution of certain types of paleoecosystems, as well as tracking fungal-plant interactions through time.